As a copywriter in Austin, I love this typewriter ad. 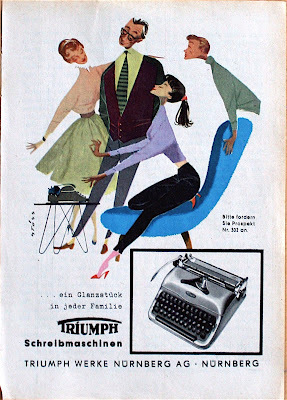 As a mid-century design lover I love this mid-century ad. Google translate tells me the tagline reads: A gem in any family. I agree...cool ad. Coincidentally, I just did a typewriter themed post.